Sunny wishes is the name of the set I have featured today and also how I am feeling. Over the Easter weekend we experienced sun, rain, warmth and chilliness, but my wish is for sunshine! I have used the same stamp to create both cards today but have varied the technique and layout. 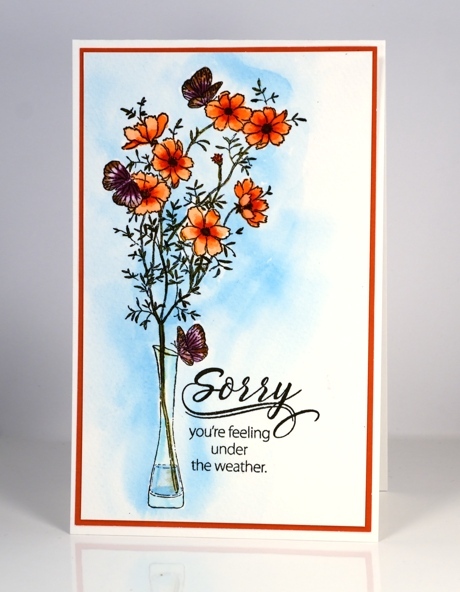 For the card above I inked only the floral portion of the stamp with distress stains. With such a small image there was not much blending to do but I did fill the petals of the flowers by pulling stain from the outline and then added the darker centre with stain on a brush. To finish I added some green splatter and the coordinating sentiment and mat. In the card above you can see the full image stamped in versafine onyx black. I painted blue around the image and in the vase with Dr Ph Martins Hydrus Watercolor Pthalo Blue and let it dry. I painted the flowers, butterflies and foliage with distress stain but you could easily use distress markers directly on the image and then blend the colour with a damp brush. To finish I once again added a sentiment and a coordinating mat. My goodness, the two cards are so completely different you wouldn’t know it was the same stamp. Each so beautiful! Both cards are lovely! I couldn’t choose a favorite! That first card is just gorgeous! 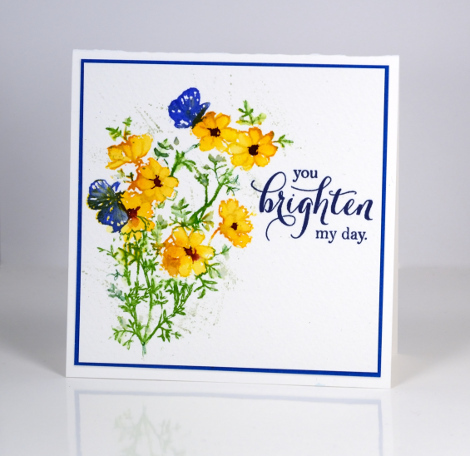 Love that bright blue and yellow combination you used. I think we are all ready for some beautiful flowers to start blooming. Two perfect-for-spring cards! Beautiful, Heather. Both of these are so pretty, Heather, but the bright yellow flowers make my heart sing! So pretty and unique it is fun to see the image used both ways and how it created 2 totally different cards. Love your work.